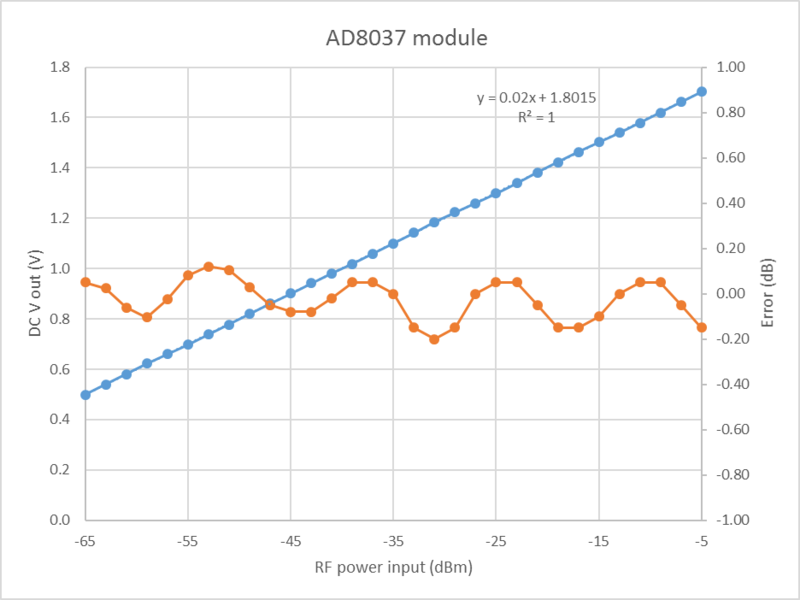 The response of the AD8397 has some ripple in the transition between log amp stages. The log cell ranges are 14.3dB, so min error repeats every 14.3dB. My own practice is to calibrate at -62 and -5dBm input as they fall approximately on the mid line of the ripple trend (4 cycles of the error curve). So, note the values for intercept and slope used in the running configuration (they are reported in the text log at startup), and write down the displayed reading for inputs -62 and -5dBm. 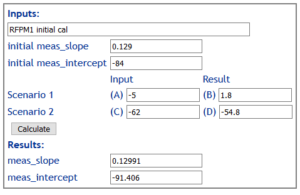 Example log showing calibration values in use. 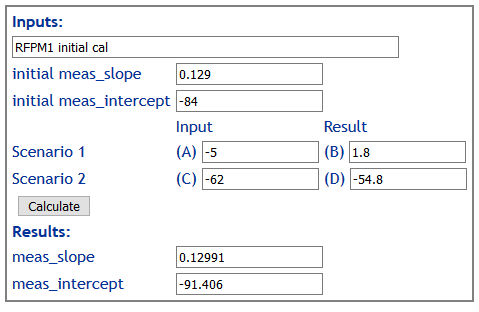 Enter the current values into the Slope – intercept calibration constants calculator as in the example below. Use the values from your own log, or the cfg.json file in your data directory. 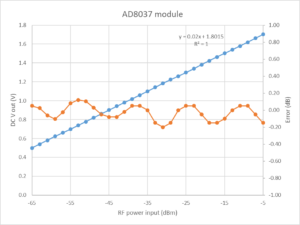 Calculate the new calibration constants, and enter them into the cfg.json file in the data directory, connect the MCU to the PC and in the Arduino IDE, go to tools / ESP8266 Sketch Data Upload to creat a new SPIFFS image and load it to the MCU. After upload, the log shows the new startup values. Check the calibration with the new cal data. If it needs some fine adjustment, use the same calculator but starting with the current values and observed measurements. Don’t touch the pots on the AD8307 module, otherwise you have to go through the process for the changed output conditions.